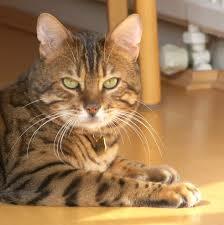 The Bengal Cat is a breed of domestic cat that is a hybrid of a domestic cat and the Asian leopard cat (ALC). Its name comes from the taxonomic name for its wild ancestor, Prionailurus bengalensis and retain a wild look with large spots and rosettes on their coat with a white belly and body structure like the ALC. However, as long as at least four generations removed from the wild ancestor, these make excellent pets. The first written mention of the Bengal cat was in 1889 when an author name Harrison Weir referred to them in his book Ours Cats and All About Them. In 1927, an article was written in the magazine Cat Gossip discussing the hybridisation of domestic and wild cats and referred directly to what would become known as the Bengal cat. The earliest confirmed mention of the ALC-domestic cross was in 1934 when a Belgian scientific journal discussed the breed then again in 1941 from a Japanese publication, where one of these hybrids was kept as a pet. The concerted effort to breed the Bengal started in the 1970s with Dr William Centerwall. He started the research as part of his studies into an apparent immunity that the ALC had to feline leukaemia and the cats he created were eventually given to Jean Sugden Mill when Dr Centerwall fell ill.
Jean Mill worked hard to get the Bengal recognised and they were accepted by The International Cat Association (TICA) in 1983. She had not planned to keep them as hybrids but to further cross them with domestic cats and create more domesticated versions. Other important early breeders included Greg and Elizabeth Kent who worked on breeding Bengals from ALCs and Egyptian Maus. Many of the current Bengals come from this line in part. Despite the success of the breed, with over 60,000 cats registered with TICA, some cat registries still don’t recognise them. From the breeding of the Bengal and the Ocicat, another breed has been created, called the Cheetoh. This cat has the spotted patterns of both of the cats and are currently recognised by TICA. Longhaired Bengals have also began to appear among litters of kittens but is a recessive gene so tracking its appearance can be difficult. If both parents carry this recessive gene, then a longhaired kitten can be produced. Often these kittens were spayed as the longhaired variant wasn’t recognised for showing purposes but in 2013, the longhaired Bengal was granted preliminary breed status under the name Cashmere by certain registries. One of the main appeals of the Bengal are their wild-type markings with large spots and rosettes, a white belly and a physical structure that resembles the ALC. Rosettes occur on the back and sides and stripes elsewhere while there are also ‘mascara’ markings where horizontal stripes along the eyes and stripes on the forelegs. There are two types of Bengal colouring; brown spotted or snow spotted. Within the brown category, marble or spotted markings are accepted including spotted rosettes. Snow Bengals are either marble or spotted and can be sub-divided into blue eyes and other colour eyes. TICA recognises a number of colours overall including brown, seal lynx point, silver, sepia, mink as well as the spotted patterns. Once a cat is four generations from a wild ancestor, the breed is a gentle and makes a great pet. Before the fourth generation, these cats are only kept in special conditions for breeding purposes and not to live with people as part of the family. Once far enough removed from the wild ancestor, the Bengal is an intelligent cat that has a genuine two-way relationship with its owners. They are very active around the house and like to take part in whatever is going on. They are also very athletic and agile, climbing and running for the fun of it. While generally healthy, in recent times a new genetic disease has been discovered among the cats that can lead to blindness within the first year of age. Work is being done to find the cause of this and to then eliminate it from the breeding pool to prevent its reoccurrence. Hypertrophic cardiomyopathy, the most common heart condition in domestic cats, has a 16% chance of occurrence in Bengals. Previous post: Why Should I Microchip My Cat?